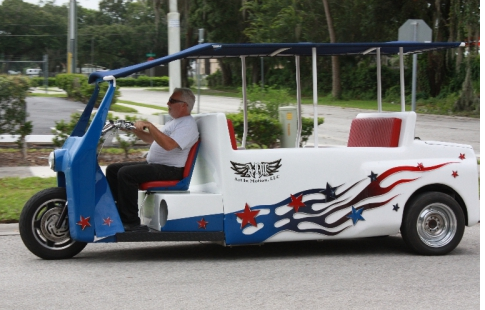 Art In Motion’s Tuk Tuk Trike is a fun vehicle to drive around town and to customize to fit your favorite theme. It is completely manufactured using parts designed and built in the United States of America. Art In Motion designs, build and customizes this vehicle in Kissimmee, Florida. This page shows the third generation design. The first design was much more like a motorcycle and can be seen here. Pricing has not yet been set. Call (407) 847-0119 for information.